from physical suffering, there is nothing real." The opium poppy is cultivated in lower Mesopotamia. The Sumerians refer to it as Hul Gil, the 'joy plant.' The Sumerians would soon pass along the plant and its euphoric effects to the Assyrians. The art of opium poppy-culling would continue from the Assyrians to the Babylonians who in turn would pass their knowledge onto the Egyptians. In the capital city of Thebes, Egyptians begin cultivation of opium thebaicum, grown in their famous poppy fields. The opium trade flourishes during the reign of Thutmose IV, Akhenaton and King Tutankhamen. The trade route included the Phoenicians and Minoans who move the profitable item across the Mediterranean Sea into Greece, Carthage, and Europe. On the island of Cyprus, the "Peoples of the Sea" craft surgical-quality culling knives to harvest opium, which they would cultivate, trade and smoke before the fall of Troy. Hippocrates, "the father of medicine", dismisses the magical attributes of opium but acknowledges its usefulness as a narcotic and styptic in treating internal diseases, diseases of women and epidemics. Alexander the Great introduces opium to the people of Persia and India. Opium thebaicum, from the Egyptian fields at Thebes, is first introduced to China by Arab traders. Avicenna of Persia teaches that opium is "the most powerful of stupefacients." Ancient Indian medical treatises The Shodal Gadanigrah and Sharangdhar Samahita describe the use of opium for diarrhoea and sexual debility. The Dhanvantri Nighantu also describes the medical properties of opium. Opium disappears for two hundred years from European historical record. Opium had become a taboo subject for those in circles of learning during the Holy Inquisition. In the eyes of the Inquisition, anything from the East was linked to the Devil. The Portuguese, while trading along the East China Sea, initiate the smoking of opium. The effects were instantaneous as they discovered but it was a practice the Chinese considered barbaric and subversive. During the height of the Reformation, opium is reintroduced into European medical literature by Paracelsus as laudanum. These black pills or "Stones of Immortality" were made of opium thebaicum, citrus juice and quintessence of gold and prescribed as painkillers. Residents of Persia and India begin eating and drinking opium mixtures for recreational use. Portuguese merchants carrying cargoes of Indian opium through Macao direct its trade flow into China. Ships chartered by Elizabeth I are instructed to purchase the finest Indian opium and transport it back to England. Rajput troops fighting for the Mughals introduce the habit of taking opium to Assam. Opium is given daily to Rajput soldiers. From 1637 onwards Opium becomes the main commodity of British trade with China. English apothecary, Thomas Sydenham, introduces Sydenham's Laudanum, a compound of opium, sherry wine and herbs. His pills along with others of the time become popular remedies for numerous ailments. Chinese emperor, Yung Cheng, issues an edict prohibiting the smoking of opium and its domestic sale, except under license for use as medicine. The British East India Company assumes control of Bengal and Bihar, opium-growing districts of India. British shipping dominates the opium trade out of Calcutta to China. Linnaeus, the father of botany, first classifies the poppy, Papaver somniferum - 'sleep-inducing', in his book Genera Plantarum. The British East India Company's import of opium to China reaches a staggering two thousand chests of opium per year. East India Company assumes monopoly over all the opium produced in Bengal, Bihar and Orissa. Warren Hastings introduces system of contracts. Contracts for dealing in opium were awarded through auction. The British East India Company establishes a monopoly on the opium trade. 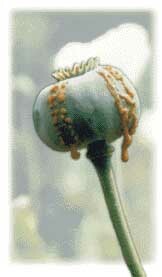 All poppy growers in India were forbidden to sell opium to competitor trading companies. The import of opium into China becomes a contraband trade. Silver was smuggled out to pay for smuggling opium in. The British Levant Company purchases nearly half of all of the opium coming out of Smyrna, Turkey strictly for importation to Europe and the United States. Friedrich Sertürner of Paderborn, Germany discovers the active ingredient of opium by dissolving it in acid then neutralizing it with ammonia. The result: alkaloids - Principium somniferum or morphine. A smuggler from Boston, Massachusetts, Charles Cabot, attempts to purchase opium from the British, then smuggle it into China under the auspices of British smugglers. American John Cushing, under the employ of his uncles' business, James and Thomas H. Perkins Company of Boston, acquires his wealth from smuggling Turkish opium to Canton. John Jacob Astor of New York City joins the opium smuggling trade. His American Fur Company purchases ten tons of Turkish opium then ships the contraband item to Canton on the Macedonian. Astor would later leave the China opium trade and sell solely to England. Thomas De Quincey publishes his autobiographical account of opium addiction, Confessions of an English Opium-eater. E. Merck & Company of Darmstadt, Germany, begins commercial manufacturing of morphine. Elizabeth Barrett Browning falls under the spell of morphine. This, however, does not impede her ability to write "poetical paragraphs." Lin Tse-Hsu, imperial Chinese commissioner in charge of suppressing the opium traffic, orders all foreign traders to surrender their opium. In response, the British send expeditionary warships to the coast of China, beginning The First Opium War. New Englanders bring 24,000 pounds of opium into the United States. This catches the attention of U.S. Customs which promptly puts a duty fee on the import. The Chinese are defeated by the British in the First Opium War. Along with paying a large indemnity, Hong Kong is ceded to the British. The Treaty of Nanking between the Queen of Great Britain and the Emperor of China. Dr. Alexander Wood of Edinburgh discovers a new technique of administering morphine, injection with a syringe. He finds the effects of morphine on his patients instantaneous and three times more potent. The British arrive in lower Burma, importing large quantities of opium from India and selling it through a government-controlled opium monopoly. The British and French renew their hostilities against China in the Second Opium War. In the aftermath of the struggle, China is forced to pay another indemnity. The importation of opium is legalized. English researcher, C.R. Wright first synthesizes heroin, or diacetylmorphine, by boiling morphine over a stove. Britain passes the Opium Act with hopes of reducing opium consumption. Under the new regulation, the selling of opium is restricted to registered Chinese opium smokers and Indian opium eaters while the Burmese are strictly prohibited from smoking opium. The British acquire Burma's northeast region, the Shan state. Production and smuggling of opium along the lower region of Burma thrives despite British efforts to maintain a strict monopoly on the opium trade. U.S. Congress, in its earliest law-enforcement legislation on narcotics, imposes a tax on opium and morphine. Heinrich Dreser working for The Bayer Company of Elberfeld, Germany, finds that diluting morphine with acetyls produces a drug without the common morphine side effects. Bayer begins production of diacetylmorphine and coins the name "heroin." Heroin would not be introduced commercially for another three years. The philanthropic Saint James Society in the U.S. mounts a campaign to supply free samples of heroin through the mail to morphine addicts who are trying give up their habits. Efforts by the British and French to control opium production in Southeast Asia are successful. Nevertheless, this Southeast region, referred to as the 'Golden Triangle', eventually becomes a major player in the profitable opium trade during the 1940s. In various medical journals, physicians discuss the side effects of using heroin as a morphine step-down cure. Several physicians would argue that their patients suffered from heroin withdrawal symptoms equal to morphine addiction. Heroin addiction rises to alarming rates. China and England finally enact a treaty restricting the Sino-Indian opium trade. Several physicians experiment with treatments for heroin addiction. Dr. Alexander Lambert and Charles B. Towns tout their popular cure as the most "advanced, effective and compassionate cure" for heroin addiction. The cure consisted of a 7 day regimen, which included a five day purge of heroin from the addict's system with doses of belladonna delirium. The first federal drug prohibition passes in the U.S. outlawing the importation of opium. It was passed in preparation for the Shanghai Conference, at which the US presses for legislation aimed at suppressing the sale of opium to China. The International Opium Commission convenes in Shanghai. Heading the U.S. delegation are Dr. Hamilton Wright and Episcopal Bishop Henry Brent. Both would try to convince the international delegation of the immoral and evil effects of opium. After 150 years of failed attempts to rid the country of opium, the Chinese are finally successful in convincing the British to dismantle the India-China opium trade. The passage of Harrison Narcotics Act which aims to curb drug (especially cocaine but also heroin) abuse and addiction. It requires doctors, pharmacists and others who prescribed narcotics to register and pay a tax. The U.S. Treasury Department's Narcotics Division (the first federal drug agency) bans all legal narcotics sales. With the prohibition of legal venues to purchase heroin, addicts are forced to buy from illegal street dealers. In the wake of the first federal ban on opium, a thriving black market opens up in New York's Chinatown. The majority of illegal heroin smuggled into the U.S. comes from China and is refined in Shanghai and Tietsin. During World War II, opium trade routes are blocked and the flow of opium from India and Persia is cut off. Fearful of losing their opium monopoly, the French encourage Hmong farmers to expand their opium production. Burma gains its independence from Britain at the end of World War II. Opium cultivation and trade flourishes in the Shan states. Corsican gangsters dominate the U.S. heroin market through their connection with Mafia drug distributors. After refining the raw Turkish opium in Marseilles laboratories, the heroin is made easily available for purchase by junkies on New York City streets. U.S. efforts to contain the spread of Communism in Asia involves forging alliances with tribes and warlords inhabiting the areas of the Golden Triangle, (an expanse covering Laos, Thailand and Burma), thus providing accessibility and protection along the southeast border of China. In order to maintain their relationship with the warlords while continuing to fund the struggle against communism, the U.S. and France supply the drug warlords and their armies with ammunition, arms and air transport for the production and sale of opium. The result: an explosion in the availability and illegal flow of heroin into the United States and into the hands of drug dealers and addicts. U.S. involvement in Vietnam is blamed for the surge in illegal heroin being smuggled into the States. To aid U.S. allies, the Central Intelligence Agency (CIA) sets up a charter airline, Air America, to transport raw opium from Burma and Laos. As well, some of the opium would be transported to Marseilles by Corsican gangsters to be refined into heroin and shipped to the U.S via the French connection. The number of heroin addicts in the U.S. reaches an estimated 750,000. Heroin exportation from Southeast Asia's Golden Triangle, controlled by Shan warlord, Khun Sa, becomes a major source for raw opium in the profitable drug trade. Solomon Snyder and Candace Pert discover opiate receptor in the brain. President Nixon creates the DEA (Drug Enforcement Administration) under the Justice Dept. to consolidate virtually all federal powers of drug enforcement in a single agency. Saigon falls. The heroin epidemic subsides. The search for a new source of raw opium yields Mexico's Sierra Madre. "Mexican Mud" would temporarily replace "China White" heroin until 1978. Hans Kosterlitz and his colleagues isolate and purify an endogenous opioid in the brain, enkephalin. The U.S. and Mexican governments find a means to eliminate the source of raw opium - by spraying poppy fields with Agent Orange. The eradication plan is termed a success as the amount of "Mexican Mud" in the U.S. drug market declines. In response to the decrease in availability of "Mexican Mud", another source of heroin is found in the Golden Crescent area - Iran, Afghanistan and Pakistan, creating a dramatic upsurge in the production and trade of illegal heroin. Comedian John Belushi of Animal House fame, dies of a heroin-cocaine - "speedball" overdose. U.S. State Department officials conclude, after more than a decade of crop substitution programs for Third World growers of marijuana, coca or opium poppies, that the tactic cannot work without eradication of the plants and criminal enforcement. Poor results are reported from eradication programs in Burma, Pakistan, Mexico and Peru. Opium production in Burma increases under the rule of the State Law and Order Restoration Council (SLORC), the Burmese junta regime. A U.S. Court indicts Khun Sa, leader of the Shan United Army and reputed drug warlord, on heroin trafficking charges. The U.S. Attorney General's office charges Khun Sa with importing 3,500 pounds of heroin into New York City over the course of eighteen months, as well as holding him responsible for the source of the heroin seized in Bangkok. Colombia's drug lords are said to be introducing a high-grade form of heroin into the United States. The Thai army with support from the U.S. Drug Enforcement Agency (DEA) launches its operation to destroy thousands of acres of opium poppies from the fields of the Golden Triangle region. Efforts to eradicate opium at its source remains unsuccessful. The Clinton Administration orders a shift in policy away from the anti- drug campaigns of previous administrations. Instead the focus includes "institution building" with the hope that by "strengthening democratic governments abroad, [it] will foster law-abiding behavior and promote legitimate economic opportunity." The Golden Triangle region of Southeast Asia is now the leader in opium production, yielding 2,500 tons annually. According to U.S. drug experts, there are new drug trafficking routes from Burma through Laos, to southern China, Cambodia and Vietnam. Khun Sa, one of Shan state's most powerful drug warlords, "surrenders" to SLORC. The U.S. is suspicious and fears that this agreement between the ruling junta regime and Khun Sa includes a deal allowing "the opium king" to retain control of his opium trade but in exchange end his 30-year-old revolutionary war against the government. International drug trafficking organizations, including China, Nigeria, Colombia and Mexico are said to be "aggressively marketing heroin in the United States and Europe." Bumper opium crop of 4,600 tons in Afghanistan. UN Drug Control Program estimates around 75% of world's heroin production is of Afghan origin. Taliban leader Mullah Omar bans poppy cultivation in Afghanistan; United Nations Drug Control Program confirms opium production eradicated. Portugal decriminalizes all drugs for personal consumption. War in Afghanistan; heroin floods the Pakistan market. Taleban regime overthrown. U.N. Drug Control and Crime Prevention Agency announces Afghanistan has regained its position as the world's largest opium producer. UK Government health plan will make heroin available free on National Health Service "to all those with a clinical need for it". Consumers are sceptical. State sponsored heroin trafficking: Korea's attempt to penetrate the Australian heroin market hits rocky waters. US Food and Drug Administration (FDA) and Drug Enforcement Administration (DEA) launch special task force to curb surge in Net-based sales of narcotics from online pharmacies. Consumer groups file a lawsuit against Oxycontin maker Purdue Pharma. The company is alleged to have used fraudulent patents and deceptive trade practices to block the prescription of cheap generic medications for patients in pain. Singapore announces plans to execute a self-medicating heroin user, Chew Seow Leng. Under Singapore law, chronic heroin users with a high physiological tolerance to the drug are deemed to be "traffickers". Consumers face a mandatory death sentence if they take more than 15 grams (0.5 ounces) of heroin a day. A Tasmanian company publishes details of its genetically-engineered opium poppies. Top1 [thebaine oripavine poppy 1] mutants do not produce morphine or codeine. Tasmania is the source of some 40% of the world's legal opiates; its native crop of poppies is already being re-engineered with the mutant stain. Conversely, some investigators expect that the development of genetically-engineered plants and microorganisms to manufacture potent psychoactive compounds will become widespread later in the 21st century. Research into transgenic psychotropic botanicals and microbes is controversial; genes from mutants have a habit of spreading into the wild population by accident as well as design. The FDA grants a product license to Purdue's pain medication Palladone: high dose, extended-release hydromorphone capsules. Palladone is designed to provide "around-the-clock" pain-relief for opioid-tolerant users. Unannounced withdrawal of newly-issued DEA guidelines to pain specialists. The guidelines had pledged that physicians wouldn't be arrested for providing adequate pain-relief to their patients. DEA drug-diversion chief Patricia Good earlier stated that the new rules were meant to eliminate an "aura of fear" that stopped doctors treating pain aggressively. McLean pain-treatment specialist Dr William E. Hurwitz is sent to prison for allegedly "excessive" prescription of opioid painkillers to chronic pain patients. Testifying in court, Dr Hurwitz describes the abrupt stoppage of prescriptions as "tantamount to torture". Researchers at Ernest Gallo Clinic and Research Center in Emeryville, California, inhibit expression of the AGS3 gene in the core of nucleus accumbens. Experimentally blocking the AGS3 gene curbs the desire for heroin in addicted rodents. By contrast, activation of the reward centres of the nucleus accumbens is immensely pleasurable and addictive. The possible effects of overexpression and gene amplification of AGS3 remain unexplored. Neuroscientists close in on the (hypothetical) final common pathway of pleasure in the brain. The "hedonic hotspot" is activated by agonists of the mu opioid receptor. In rats, at least, the hedonic hotspot is located in a single cubic millimeter of tissue: the substrates of pure bliss may lie in medium spiny neurons in the rostrodorsal region of the medial shell of the nucleus accumbens. In Mexico, Congress passes a bill legalising the private personal use of all drugs, including opium and all opiate-based drugs. President Vicente Fox promises to to sign the measure, but buckles a day later under US government pressure. The bill is referred back to Congress for changes. "We welcome the idea of Mexico reviewing the legislation to avoid the perception that drug use would be tolerated in Mexico," says the U.S. Embassy in Mexico City. University of Southern California neuroscientist Irving Biederman publishes in the American Scientist a theory of knowledge-acquisition likening all human beings to "junkies". On this hypothesis, knowledge junkies are driven to learn more information by a craving for the brain's own natural opium-like substances. The head of the United Nations Office on Drugs and Crime reports that Afghanistan's harvest in 2006 will be around 6,100 metric tons of opium - a world record. This figure amounts to some 92% of global opium supply. Senior UK police officer Howard Roberts advocates legalisation of heroin and its availability without charge on National Health Service (NHS) prescription. Afghanistan's poppy production rises an estimated 15 percent over 2006. Afghanistan now accounts for 95 percent of the world's opium poppy crop, a 3 percentage point increase over last year. The US State Department's top counternarcotics official Tom Schweich claims that Afghanistan is now "providing close to 95 percent of the world's heroin". Death of Golden Triangle opium lord and former Shan separatist leader Khun Sa (1933-2007). At its peak, Khun Sa's narcotics empire controlled production of an estimated quarter of the world's heroin supply. Swiss voters overwhelmingly endorse a permanent and comprehensive legalized heroin program. FDA announces plans further to restrict access to opioid-based pain-relievers by American citizens and their doctors. According to the World Health Organization, around 80% of the world’s population does not have adequate access to pain relief. The international organisation Human Rights Watch (HRW) blames a failure of leadership, inadequate training of health care workers, and “over-zealous drug control efforts”. Research published in Proceedings of the National Academy of Sciences confirms that mice (and humans?) can synthesise their own morphine. Seattle hosts Kappa Therapeutics, the world's first conference dedicated to kappa opioids and antagonists. The kappa receptor is the "nasty" opioid receptor, bound by dynorphin. Selective, orally active kappa opioid antagonists, notably JDTic and the shorter-acting zyklophin, are subjectively enjoyable and relaxing; but they (probably) lack significant "abuse potential". Investigators hope that selective kappa opioid antagonists can be used therapeutically to treat anxiety disorders, clinical depression, anhedonia, eating disorders, alcoholism and a variety of substance abuse disorders. Unexpected discovery that the licensed antidepressant tianeptine (Stablon) is a full agonist at the mu and delta opioid receptors with negligible effect at the kappa opioid receptors. State-owned Brazilian Agricultural Research Corporation Embrapa announce the discovery of mood-brightening and anxiolytic opioid peptides in coffee that exert a longer-lasting effect than morphine. Simon & Schuster, Ltd., 1996.